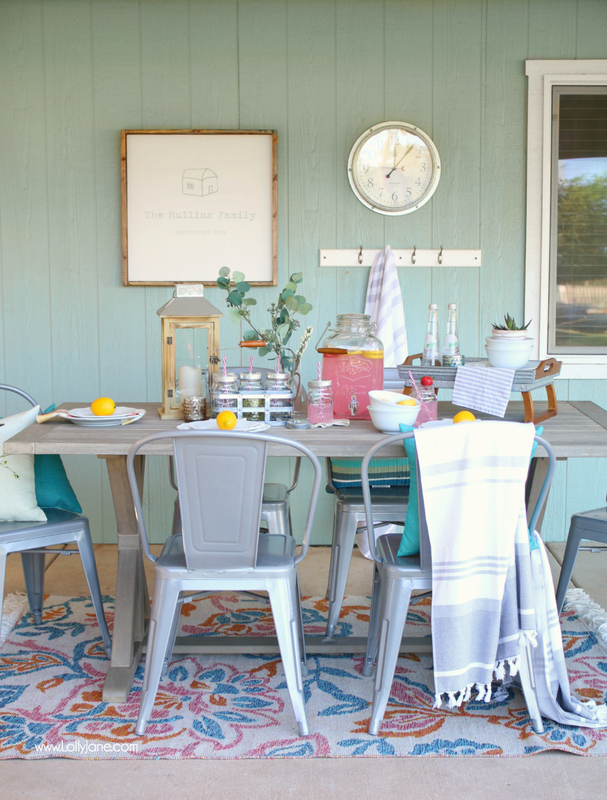 This Porch Decorating Ideas for Summer post, is sponsored by Walmart and SheKnows Media. You’ll love these porch decorating ideas for summer. 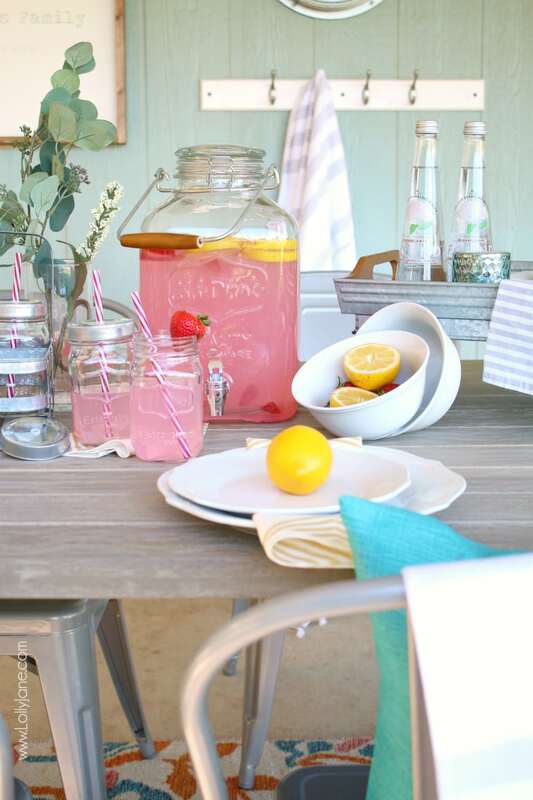 The best part is that these are all budget friendly ideas to decorate your porch for the summer! 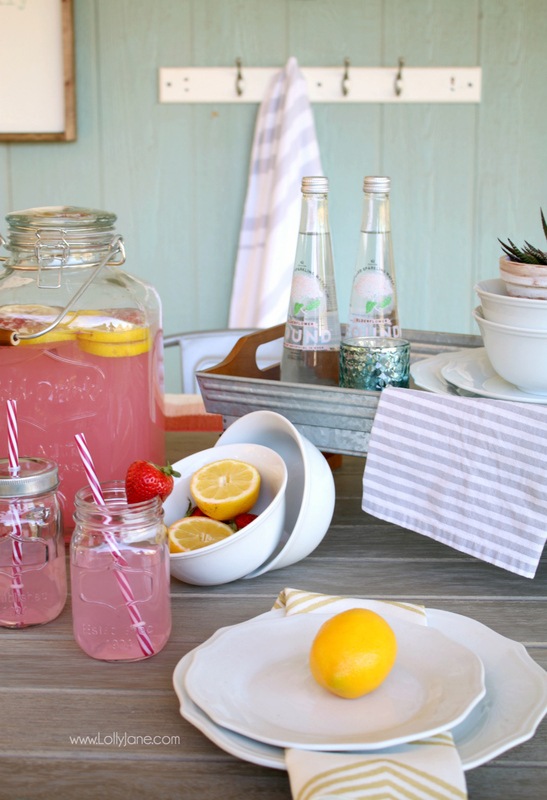 Summertime around here means outdoor entertaining and lots of it! With my sister next door, my brother across the street, and 4 other siblings in our town, we attend and/or host a lot of gatherings. 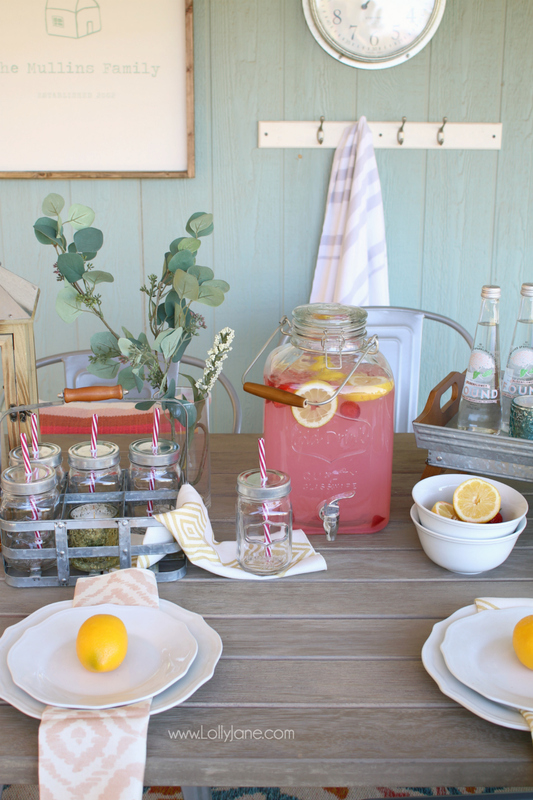 Having my staple table scape items to be able to simply collect from my pantry and set outside takes a lot of the guesswork out of what and how to put together for the next party or event. We’ve collected a few tips we’ve learned along the way to help make your own outdoor gathering set up go much smoother. Tip 1: “It’s all about that base,” er, base. 😉 To style your own outdoor entertaining area, start with a rug; this sets the whole tone of your color scheme. We went to our local Walmart because you know we love a good deal and the Better Homes and Gardens line there is to die for gorgeous, with both style and price! We wanted a rug that wouldn’t be hard to clean from spilled food or drinks (hello kids on summer break!) so we headed to the outdoor garden department and chose the BHG Jacobean Rug that is for both indoor and outdoor use. We like the bold blue, orange and pinks paired together but also adore the white fringe on the end of the rug that coordinates well with the white dinnerware. Hues that bright and cheery are perfect for the summer months but we didn’t want to style everything in color so we could easily swap themes for the next party so our next tip is to keep your furniture neutral. Tip 2 Porch Decorating Ideas for Summer: Keep your furniture neutral so it can be versatile no matter the event in which it will be used. We chose the BHG Camrose Farmhouse Dining Table Table that is on trend with the gorgeous weathered gray finish and beautiful signature “X” farmhouse style legs. 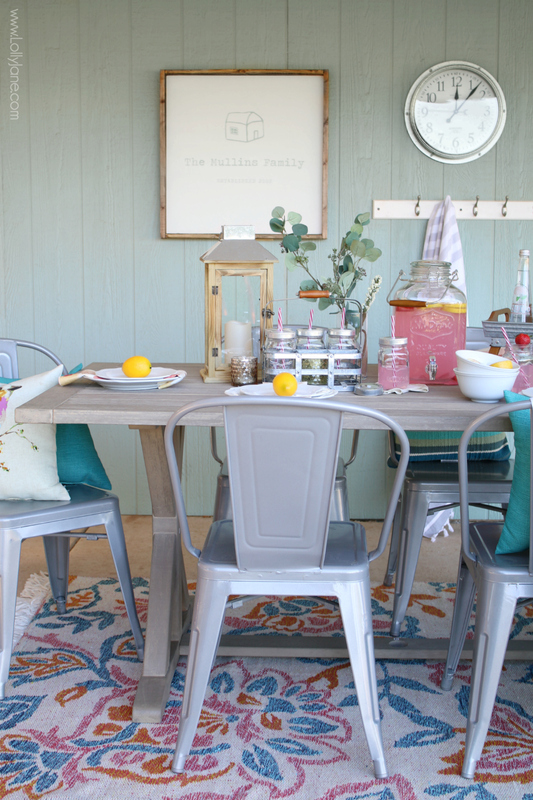 These practical BHG Camrose Chairs are metal (bless you, easy clean up!) and there are a handful of colors to select from other than gray. Now, it’s time to accessorize! Tip 3 Porch Decorating Ideas for Summer: Aim for durable pieces that will last and withstand drops or spills. 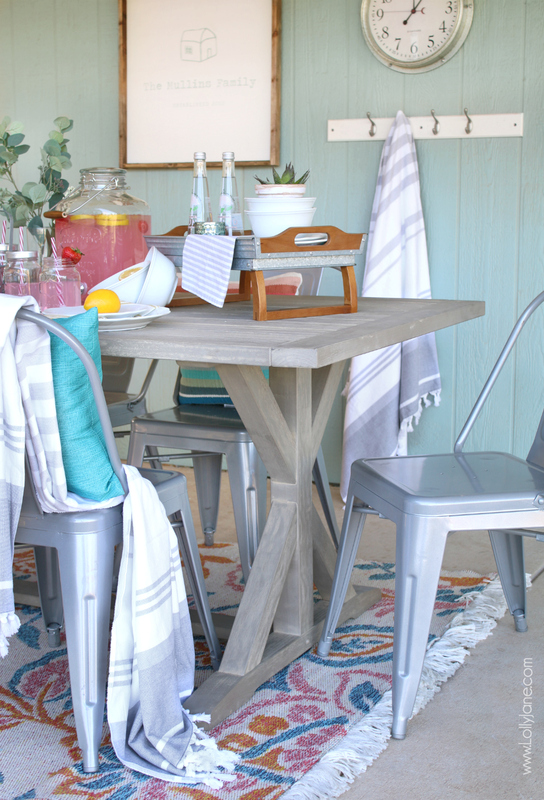 Galvanized metals are not only great for any occasion because of the versatility color-wise, but they are practical as they won’t warp if your 4-year old spills juice on it… not that that’s happened to me… okay it has so take it from this momma, metal is your friend when entertaining! The cohesive look of the gray metal also allows for lots of color in your food, linens, plates, or other items you’ll be setting inside your drink dispenser, caddy, or cups. 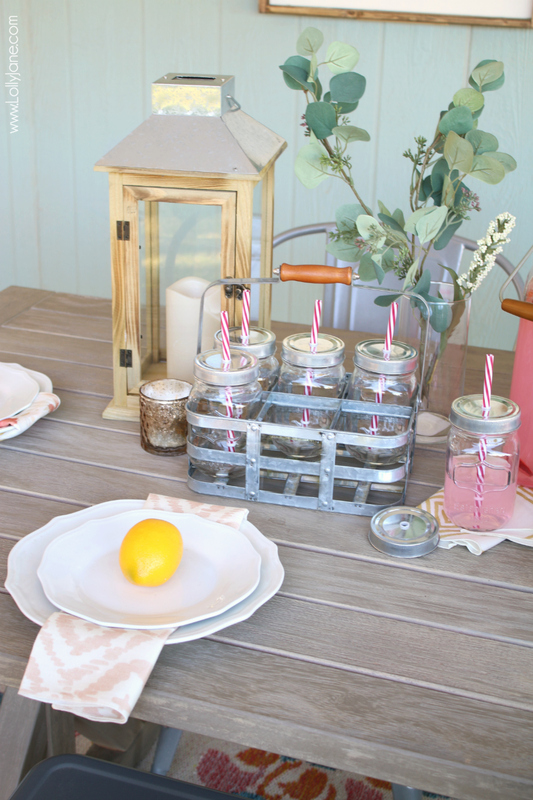 We love the farmhouse look of this BHG Drink Dispenser that plays off of the BHG Mason Jar Caddy with its glass + metals as well as the matching wood tones of that and that BHG Serving Tray. This tray is especially winning as it has legs you can fold under to allow for height changes, a must when decorating a tablescape! Tip 4 Porch Decorating Ideas for Summer: Choose “smart” lighting. No, not complicated app lighting but lighting that is smarter than my forgetful mom brain that allows me to not have to charge or turn anything on.This fun BHG Outdoor Lantern not only coordinates perfectly with its BHG line up on the table but is solar powered. It’s a great piece because you allow Mr. Sun do the charging for you and just let it do its thing come nightfall; it gives the prettiest glow to accent your outdoor entertaining display. Tip 5 Porch Decorating Ideas for Summer: Shop your yard for natural elements. I don’t have any large florals in bloom in my yard for a table top bouquet but I do have a eucalyptus tree so I simply snipped a branch off and set it in a thrifted vase. I added a faux floral from my craft stash and voila! Natural element added that gives not only adds height and warms up the space. 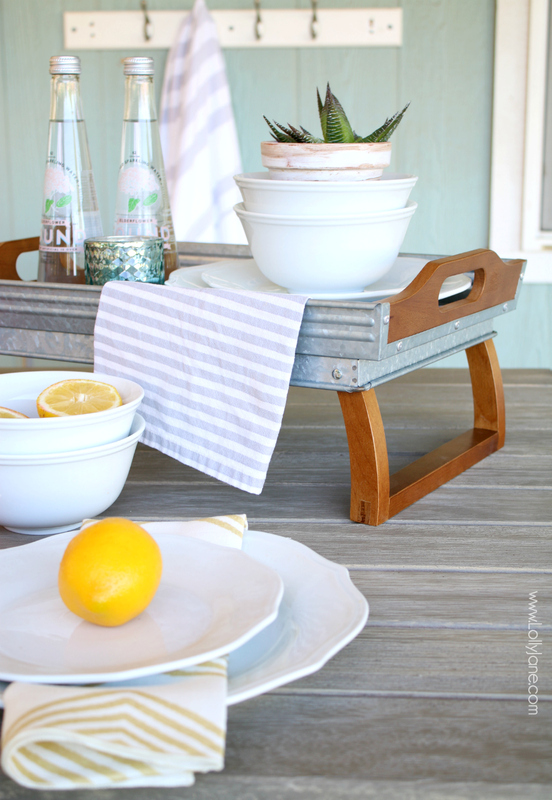 Tip 6 Porch Decorating Ideas for Summer: Food can double as decor. Lemons, oranges, or apples are not only pretty but can be grabbed, peeled, sliced, or squeezed and enjoyed by guests. Top your plates with them for a pop of color, pile in a bowl for easy picking, or just scatter around the table. Tip 7 Porch Decorating Ideas for Summer: Throws and pillows can polish off the space + add cozy comfort. 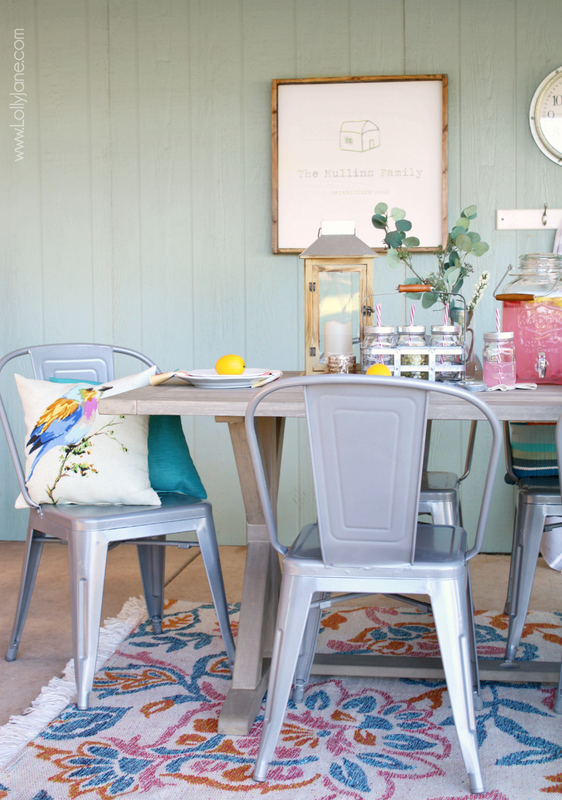 Now that your table has its “jewelry” on, time to spruce up those cold metal chairs! Toss a throw or towel over the side to not only allow guests to grab a towel after swimming but add texture to the space… these BHG Striped Towels look like a throw and have fringe that happens to pair perfectly with the rug. Aww. These Mainstay Throw Pillows are only $5 (and I scored them on clearance for $3!) and are great if they get dirty as I can just hose them off. Mom win! 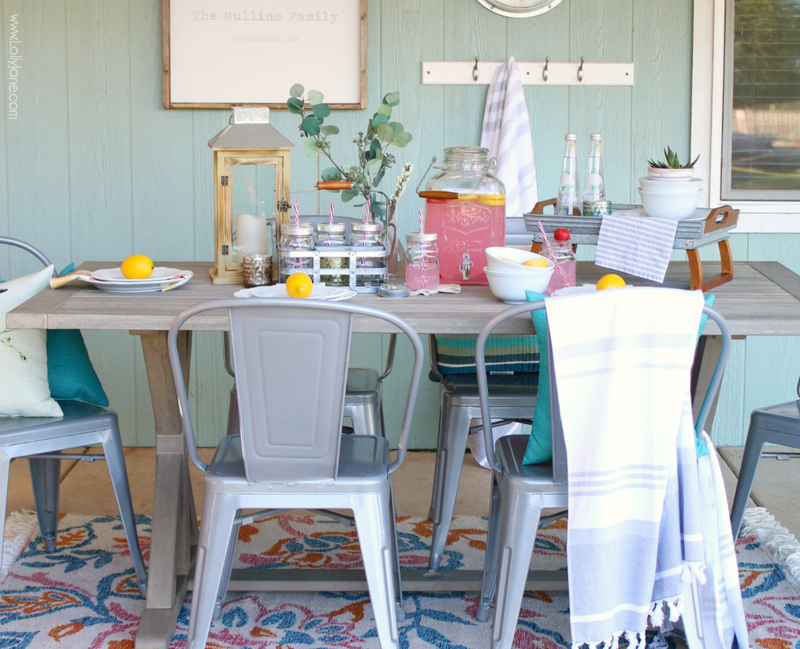 Tip 8 Porch Decorating Ideas for Summer: Function doesn’t have to be ugly. I have a handful of BHG Citronella Candles on here and you would never know they double as an insect repellant because they’re in a cute container. I’m sneaky like that. Bless you Walmart for being my one-stop-shop for all of these affordable pretties! 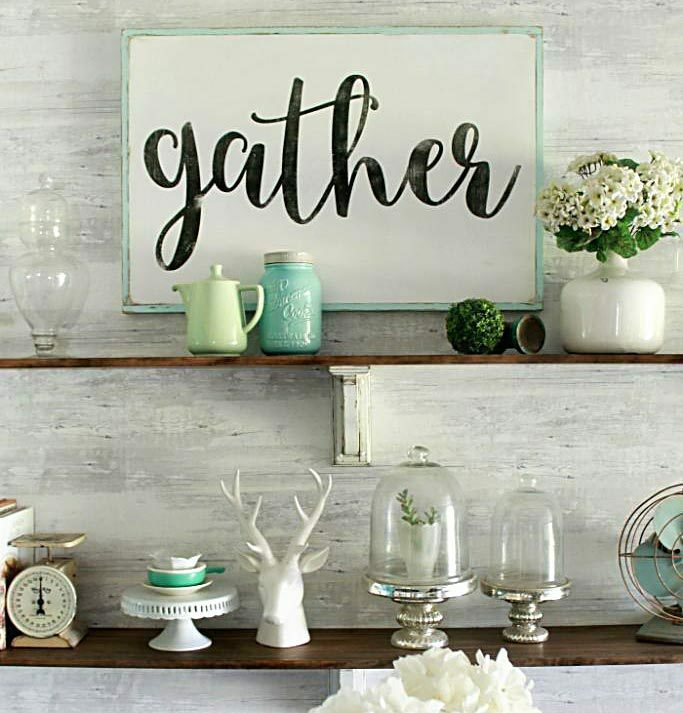 I would love to hear any tips YOU have on your own summer outdoor entertaining or decorating spaces! Looks great! I wish I had a large porch like that! I’ve always wanted a wrap-a-round but oh well. Lol. I’m actually getting ready to start on a She Shed that will have a small porch so if you have any ideas for that, I would so appreciate them!! Thanks so much! Lots of great ideas there! We’re still working on the interior so I can move all of my stuff out there. I want the paint the inside all white and use pink as an accent color, I love the shabby chic farmhouse style!! If I had a porch this is exactly how I’d want it to look. Thank you Sandra! 🙂 Happy summer!